Obituary – Kukuk, Linda Lee « Perry High School Alumni Association, Inc.
Linda Lee Kukuk, 16 year old Perry high school beauty queen, ended a five-month fight for life shortly after last midnight in Stillwater Memorial hospital. The pretty, popular junior class student at PHS, victim of an incurable disease, died at 12:50 a.m. Wednesday in the Stillwater hospital where she had been the past several weeks. Services will be at 2 p.m. Friday in Christ Lutheran church, where she had been an active youth leader. Rev. Charles Keturakat, pastor, will officiate at last rites, and burial will be in Grace Hill cemetery under direction of Parker funeral home. 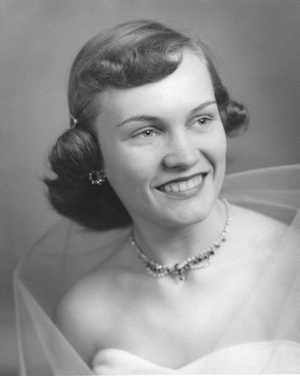 Linda was born Oct 5, 1933, in Perry, the daughter of Mrs. And Mrs. Carl Kukuk. Last year she was elected basketball queen at Perry high school, where she was an honor student and a cheerleader in the school pep club. She also was a member of the Maroon band this year. At Christ Lutheran church she took an active part in the Walther league, youth organization, and served as a Sunday school teacher. Members of Unit III, Lutheran Women’s Missionary league, will sit in a group at final services for the girl Friday. In addition to her parents, survivors are a sister, Francis, of the home, 1106 Sixth street; and maternal grandparents, Mr. and Mrs. H. D. Roads, Perry. Mrs. Kukuk is the former Vera Shelton.